It’s Fun to Eat at the Bar! I travel a lot, often by myself. While I am not averse to eating alone with a book or my iPad, I most often enjoy sitting among my soon to be friends at the bar. You usually get served more quickly and you often have small plate options not available on the full menu. Twice in New Orleans I ate memorable meals at the bar. The first was at the Acme Oyster House where I watched a highly skilled oyster shucker open hundreds of oysters an hour. I settled in my seat after only a few minutes waiting outside in a line that went around the block. A simple question of availability at the bar afforded me the chance to eat an oyster po boy and it was one of the best sandwich bites of my life. I am not sure what the sauce was but the combination of the fresh bread, perfectly fried oysters and sauce makes my mouth water as I write. The second time was at K Paul’s on Chartres Street in the French Quarter. Again, there was a large crowd waiting for tables but I spotted a spot at the end of the bar. I asked the bartender his specialty and he boasted he won the award in New Orleans several years in a row for his original twist on the New Orleans Hurricane. I must admit, it was a tasty drink. His answer was the stuffed pork chop. It was a very large pork chop filled with herbs and cheese. It has been a while so I cannot remember the particulars but it was a delicious dish. The meat was very juicy, which is no easy task on a cut so think. When a gentleman sat at the bar a few seats over he asked about the specialty that evening. The bartender asked me to let the man know my thoughts and he ordered the same thing. As we chat with the others at the bar we talked about home. He said he was traveling north to New York to attend his niece’s high school graduation. A few more minutes of conversation determined he grew up in Kenmore, NY and was attending Lewiston Porter’s graduation. It truly is a small world as Lew-Port is my alma mater, as well. You just never know who you will meet. I twice dined at the bar this past week. On Saturday we had some wine and watched the Master’s at Hops N Vines in Lewiston. We enjoyed the mussels in white wine sauce and lobster bisque mac and cheese brought down from Casa Antica. Another wonderful bar dining experience happened last week when I suggested to my friend Amy we grab one drink after work. We settled on Oliver’s where we met at Christmastime and enjoyed a chocolate martini expertly created by bartender Mike. I sincerely love watching a bartender mix a drink and interact with the crowd. 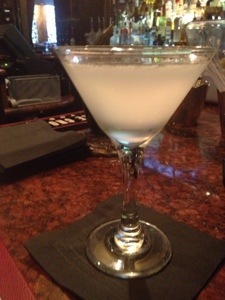 We enjoyed a French 75. This gin and lemon drink must be making a major comeback because it was new to me just a few weeks ago and I now have several ones to compare. Mike offered it with gin or vodka and since reading about it when I wrote my Town Hall review I wanted to try one with gin. He used fresh lemon juice and simple syrup. He added ice and gin to a shaker and shook to chill the liquid. He poured it into chilled martini glasses and added champagne to the top. I may have a new favorite drink. I was hungry and I talked Amy into splitting a a bowl of parsnip soup with crispy pancetta. They were kind enough to actually split the soup into two bowls. If you are watching your waistline and your wallet it is a great idea to share. Some restaurants charge a fee for this but it is still worth it because no one needs the portions served at most restaurants. We also shared a pizza. It was no ordinary pizza, either. 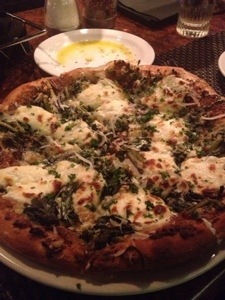 It was called a Cuccidati Pizza, bitter greens, fresh ricotta, walnut & fig pesto. I am a big fan of figs and this was really good. Mike barely suggested dessert and I pounced on the idea . Yes, the lady may have appeared too eager but the offerings were so yummy who could resist? This was a chocolate torte with a butter crunch ice cream and a toffee crisp on top. There apparently was caramel on the plate but I talk too much and Amy took complete advantage and ate most of it. I forgive her because I ate most of the toffee. It all evens out. Next time you find yourself alone at a restaurant, I highly recommend sitting at the bar. You will enjoy the camaraderie, learn about the area and never dine alone.